This afternoon I decided to check a few fields and ponds for geese before grocery shopping. I like to do a circuit from Wallingford up to Middlefield and Durham. While driving past the Apple Barrel store at Lyman Orchard's in Middlefield I couldn't help but stop in for an apple cider doughnut. Freaking delicious. Anyway, on my way out of the store I noticed a flock of a couple thousand blackbirds swarming the lawn adjacent to the pond. At about this time, friend Mark Szantyr called, and while we were talking birds I began to scan the flock from my car while it was raining. 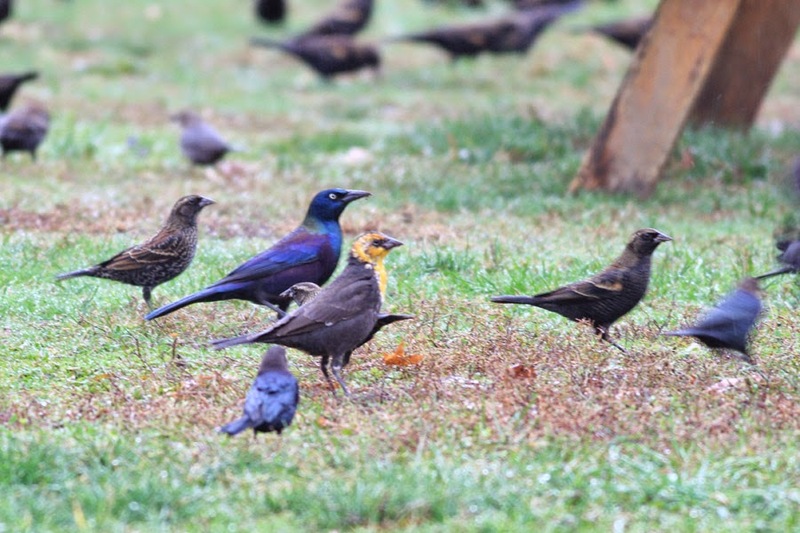 Immediately a young male YELLOW-HEADED BLACKBIRD popped out among the mixed flock. After abruptly hanging up on Mark I snapped a handful of photos (without closely checking my settings, which were off), and a big female Cooper's Hawk spooked the birds. The flock continued to linger in the area, generally perching in the trees in the rain as the Coop's made repeated passes. I gave Julian Hough a call since he happens to literally work right across the street. On his lunch break at the time, he stopped by for a minute...but we were stuck with distant birds in the rain against a bright gray sky...tough conditions. Realizing that I was never going to be able to effectively scour this flock given the hawk's constant presence and weather conditions, I packed it in for the day. Wow, such a great view, too. Amazingly cool pic altogether, what with all the other spp, including a Rusty.